Traditionally, a Thursday evening worship service in Holy Week (with confession, pardon, proclamation of the Word, and the Lord’s supper) is called a “Holy Thursday” service. But when foot washing is done, it is then called Maundy Thursday. The word “Maundy” comes from the Latin mandatum or “commandment”, and refers to the time in the upper room when Jesus washed his disciples’ feet and gave them this new commandment: “Love one another, as I have loved you.“. You are encouraged to come to the parlor at 7 PM on March 29th to participate in a Maundy Thursday service. On Good Friday (between noon and 3:00 PM) the sanctuary will be open for anyone who wishes to pray or reflect. This is the time period when Jesus hung on the cross, suffering for our sins. There will be Scriptures (related to Christ’s passion) available for anyone who wishes to read. Pastor Kelly will also be present and is available. There will be an interactive, experiential Good Friday Service (for ages 8 to adult) held on Friday, March 30th. We will begin in the sanctuary with music, then children will go to the Sunday School area and adults will use the parlor and sanctuary. There will be several stations where you can go and sit. 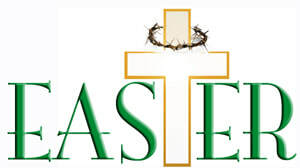 Each one will give you an opportunity to learn about an aspect of Holy Week then apply it to your own life. We will end by gathering everyone in the sanctuary for music and our closing. Join us for Easter Breakfast at 8:30 in the Fellowship room downstairs. Pancakes, sausage and beverages and various breakfast items will be provided. An Easter Egg hunt is planned for the children after. Please join us for fun, food and fellowship before the Sunday service. Sunday Service begins at 10:00 am. There will be no Sunday school this Sunday.